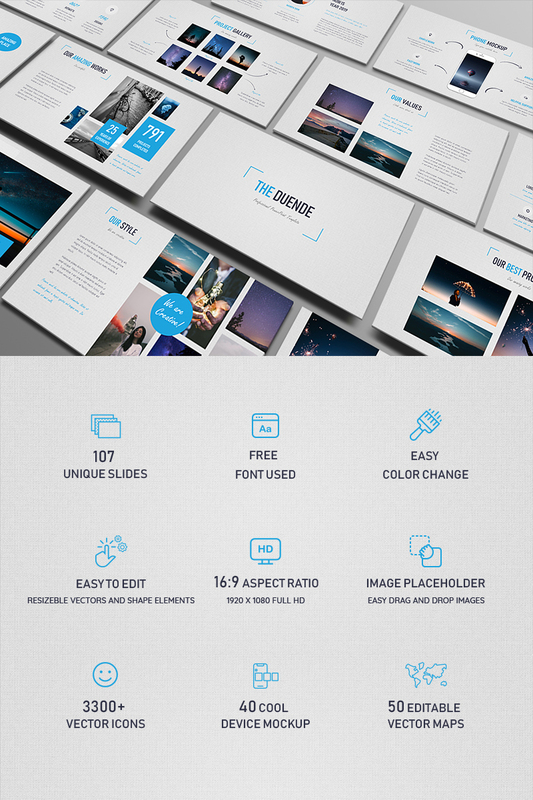 Duende is a stylish and impressive PowerPoint presentation template. All slides were designed using beautiful unique style. This presentation has an interesting, good-looking texture as a background, which gives it a unique stylish look. Duende template includes excellent and creative animation, you can change the content while keeping this animation. This template has a variety of great features including creative photo placeholders, overlays, diagrams, maps, mockups and much more! You can edit everything very easy in PowerPoint. Present your company or idea in a creative and professional way with Duende! 100+ Unique Slides + BONUS: 3300+ editable vector icons, 40+ Cool device mockups and 50 editable vector maps!